As many of you know, I am on the Board of Directors of the Christian Legal Clinics of Philadelphia; we had a meeting last night. It was an emotionally peculiar meeting as there are very exciting things happening with the Clinic – such as a couple of new locations in the works (including expanding in to Delaware County) and some great potential additions to the Board – but also some very anxious things happening as well, most significantly, our financial situation. So, we are at an interesting crossroads. We all believe that we are truly doing God’s work (e.g. : Acts 20:35, Amos 5:24, Deuteronomy 16:20, James 1:27), and we see the fruits of that each Clinic as we serve sometimes dozens of people per month and see them leave in a better situation than when they entered. We also see the spread of the Gospel to these people as many reconnect with Jesus Christ after interacting with the Clinic or, for some, connect with God for the first time. We are one of the only – if not the only – legal assistance agency which is embedded within neighborhoods as opposed to in Center City. A new location is being opened in Delaware County. Another location in the City may be opening soon. Clearly, the Clinic is making an impact among the people we are called to serve. These are developments in this City which we believe God wants and will bless. On the flip side, our finances are not where we need them to be. In fact, we are behind were we were last year. We need contributors and benefactors. We seem to be “doing the right things” but God has not seen to it that we receive the funds at this time. So, now what? Well, St. Paul says there are three great virtues: faith, hope, and charity (love) (1 Corinthians 13:13). We are continuing to fight the good fight in attempting to raise money. We are continuing to be faithful in our calling to advance the ministry of the Clinic. We also have hope. We have hope that God does what he promises and provides for his faithful followers who do his will. We can see the tangible benefits the Clinic has offered to its clients and the neighborhoods where it finds itself. So, we have hope that God will be faithful and continue to provide for those who are faithful to him. Finally, we are all proceeding in love: love of God and love of neighbor pursuant to our calling to fulfill the two greatest commandments (Matthew 22:37-40). The Scriptures and Christian history have shown us that God wants the glory due to him. One way he does that is to allow us humans to become completely weak in order to demonstrate his overwhelming strength that could not possibly have come from us. We are called to delight in our weaknesses because if we do so we can rely on God’s grace alone which will show itself to be stronger than anything we could have imagined (2 Corinthians 12:9-10). In this way, the weakest, that is those who are “last,” become strong, or “first” (Matthew 20:16). So, all this to say please (monetarily) give what you can to the Clinic to allow our ministry to move forward. Please pray to give us the strength to move forward, so that we can continue to bless our clients and the communities in which they are found, to give us the perseverance to follow God’s calling in all of this, and to give us the ability to remain faithful despite the trials the Clinic is and may have to go through. Pray that we have the faith to know that persevering through these sufferings will give us the hope that is from God the Holy Spirit (Romans 5:3-5). Finally, after last night’s meeting, I can truly say the Clinic is thankful and joyful for what God is doing through us despite this rough patch we are going through (1 Thessalonians 5:16-18). When people ask me what I do at work, I often joke that “I hear complaints and get yelled at all day.” By that I mean, my clients come to me with complaints about others, or yell at or argue with me over their case, judges are often not the nicest people to interact with, other attorneys, by the nature of their jobs, argue with me, opposing parties and witnesses, of course, hate my guts, and, my boss, like any other boss, is someone who tells me what to do in not always the gentlest of fashions. I am lucky in some ways, as other lawyers do not have the benefit of working with nice people as I do, so I suppose I should count my blessings on that score. Otherwise, I could add my unpleasant co-workers to the above list. One big exception to the above is adoptions. Now, I realize some adoptions are highly contentious, but, luckily for me, the ones I have been involved in have not been. These adoptions involve very excited adopting parents who truly, and rather obviously, love the children they are wishing to adopt. The opposing sides, in the cases I have litigated, were, either overtly or at least tacitly, attempting to better their children’s lives by cooperating with the adoption process. The children, at least those who are old enough to have some idea of what is going on, are happy to formally have a family that is secure and not subject to the insecurity, whims, substance abuse, danger, and/or other issues which beset their parents. Finally, judges always seem to be happy to preside over an adoption like this, where it is clear that everyone agrees on the adoption and are truly happy with his involvement in it to make it official. Indeed, I have never seen any other type of case where the litigants, and sometimes their attorneys, are invited to shake hands and take pictures with the judge who presided over the hearing! So, every now and again, when I think about the stress of the practice of law, I try to remember that there are times when the legal process is a happy one where everyone in the process is cooperative and on the same page and happy to pursue the goals sought. It is also very nice to know that the children are really, truly, and substantively having their lives improved through being adopted by parents who are loving, and truly want these children as a part of their lives. 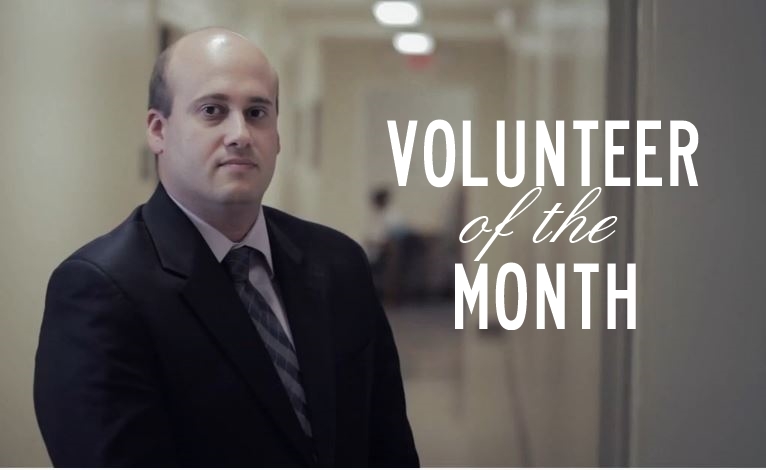 Clinic’s Volunteer of the Month! Volunteer of the Month: Daniel Popkave Daniel has been a tremendous asset in God’s hands, used to serve CLCP’s clients and community. Though only two years out of law school, he is an incredibly knowledgeable attorney, able to navigate difficult cases involving wills, taxes, and business law, and go to bat for our clients. Name a service or program we’ve run, and Daniel has been a part of it. Volunteering regularly at our Ayuda clinic? Serving as one of our contract attorneys? Chairing a committee on our Young Professionals Board? Helping a faith-based organization apply for nonprofit status? Offering a presentation on taxes for a financial literacy class? Preparing a wills clinic for seniors? Daniel has done all of these things, and is one of the reasons CLCP’s work is thriving. Thank you for your faithfulness, Daniel! It’s been amazing seeing how God is blessing so many through your compassionate, humble service. Check out Faye Cohen’s blog post ‘“The Internet is Not a Legal Expert and Other Musings ” on her blog Toughlawyerlady here. Check out Faye Cohen’s blog post ‘“Who is an Independent Contractor ” on her blog Toughlawyerlady here. On June 17, 2011Pennsylvania Governor Tom Corbett signed into law the Legislature’s latest modifications to Pennsylvania Unemployment Compensation Law. The changes described below will take effect on January 1, 2012. Though presumably designed as a cost-cutting measure with regard to the Commonwealth’s budget issues, the modifications may have some unexpected consequences for attorneys and their clients when negotiating severance packages, and lawyers who practice in this area of the law should expect some interesting, and probably confusing, issues to arise in the future. Generally speaking, the Pennsylvania Legislature revised 43 P.S. Section 804 to require Claimants to account for severance packages when applying for Unemployment Compensation Benefits. While it does not appear that the changes to Section 804(d) will require a potential Claimant to hold off on filing for unemployment benefits until after he has collected all of his severance payment, it does appear that they will adversely affect potential claimants’ eligibility for benefits. Although the new provisions may reduce eligibility for potential claimants, it seems likely that they could dramatically increase litigation as they appear to generate more questions than issues they allegedly resolve. Examples of the types of issues that may arise follow. First Example: Very often the issues surrounding an employee’s Unemployment Compensation Benefits are handled within the context of a larger and more comprehensive employment matter between the employer and former employee. When the aforesaid employment matter is resolved in some way, it is not unusual for part of the settlement funds to be issued directly to the employee, with the remaining about issued directly to the employee’s attorney. It is not clear from the new Unemployment Compensation law whether the funds issued directly to the employee’s attorney would be considered as part of the employee’s severance. Second Example: Sometimes an employer refuses to issue two (2) separate checks to the employee and his attorney. In this case, it is typical for the attorney to receive all of the funds, deduct any outstanding fees and costs, and issue a check for the difference to the employee. Although receiving an amount reduced by attorney fees and costs, the employer will generally issue the employee a 1099 or W-2 for the full amount. As above, it is not clear whether, in the context of Unemployment Compensation, the full amount, or the amount actually received by the employee would be considered as part of the employee’s severance. Third Example: Sometimes an employer issues funds directly to the employee’s attorney in the same amount as the retainer already paid by the employee. The employer issues the attorney a 1099 for the funds remitted. The attorney, in turn, issues the employee a refund of the retainer paid. Would this refund be considered part of an employee’s severance package? Fourth Example: Some employees’ settlements with employers include both a payment to an employee as severance and a sum for what is essentially punitive damages. The payment remitted for severance results in a W-2 issued to the employee by the employer while the payment remitted for “punitive damages” results in a 1099 from the employer, and is generally not subject to the standard taxes attached to salaries. In the alternative, some employers provide a lump sum without holding any amount for taxes and issue a 1099 for the lump sum. It is unclear how the Pennsylvania Department of Labor would deal with these situations. Would it consider the entire pre-tax-withholding amount to be an offset in terms of the employee’s severance package? If not, and it just considers the net amount paid, it could be to the detriment to the employee who got the lump sum as it would appear that the employee who got a pre-tax severance package got a larger amount and the Department of Labor may offset the larger amount. As seen above, while the new additions toPennsylvania’s Unemployment Compensation could reduce potential claimant’s eligibility for benefits, they appear to raise more questions than the issues they resolve. It will be interesting to see how the issues raised above, and others like them, are dealt with by the Department of Labor and the Courts. Originally published on November 18, 2011 in The Legal Intelligencer and can be found here. Check out Faye Cohen’s blog post ‘“Debunking Complaints Against Lawyers ” on her blog Toughlawyerlady here. I hope all of my readers have a great, safe, and fun Independence Day weekend. My boss, Faye Cohen, will not be opening the office on Friday so I am excited for a four day weekend! I do not take many days off so I hope to make the most of this time. When having fun this weekend, let’s all remember our Founding Fathers and be thankful for the amazing, profound, and world changing nation which emerged on July 4, 1776. Check out Faye Cohen’s blog post ‘“Hot’ Disability Issues ” on her blog Toughlawyerlady here.